I walked into the most amazing ice cream shop the other day. They featured over 20 unique, home-made flavors for gelato and sorbet. The one that jumped out right away was a flavor called "cabernet and blackberry sorbet." And it stood out because of its color, which was like a very deep dark red color that was almost black. 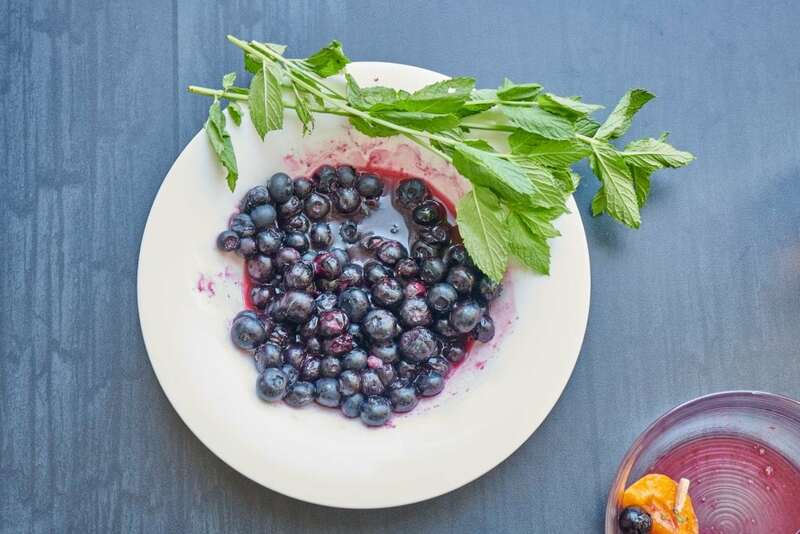 So, I decided to take a page from the gelato store to create a blueberry wine compote. A compote is a cooked fruit sauce that is very versatile. You can spoon it over cereal, ice cream, yogurt, and fresh fruit. I had bought a lot of blueberries because they were on sale and I wanted to use them up before they went too fast past their prime. I mixed the blueberries with just 2 tablespoons of rose wine. It was so easy. You just add the wine and then microwave for 2 minutes in a covered bowl. If you do not want to use wine you could use a little black tea with fresh lemon. Black tea and wine both contain tannins, which have an astringent bite. This flavor complements the sweet berries. 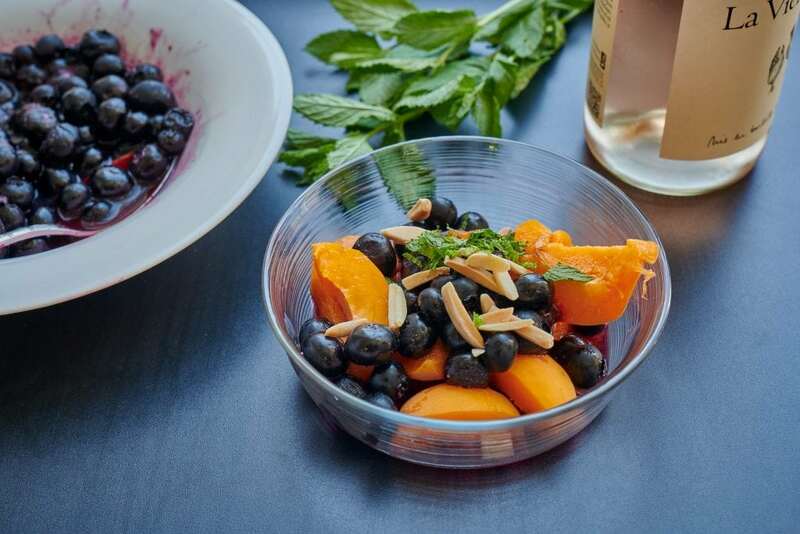 I spooned the blueberry and wine compote over some fresh apricots and then topped with shaved mint and toasted almonds. 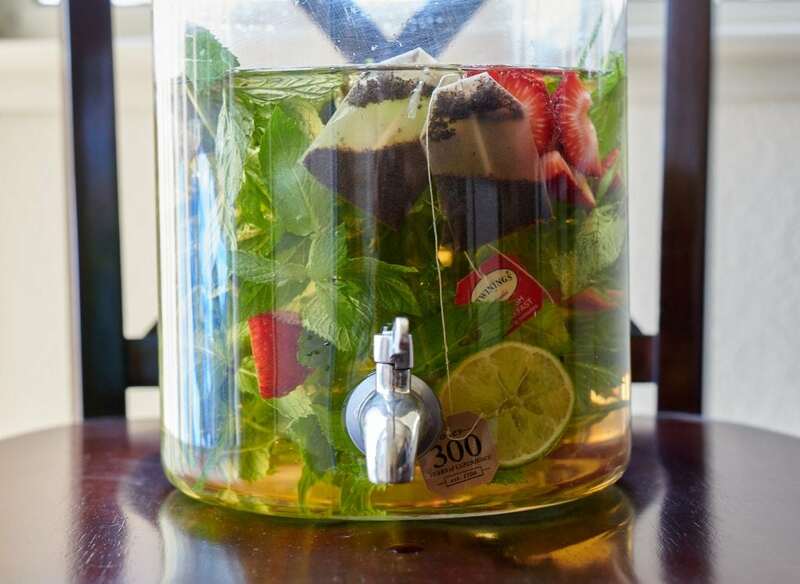 I also made a refreshing summer tea with all of the mint and berries from the farmer's market. It is so refreshing and has a sweet flavor without using any sugar. It is so simple you do not need a recipe. 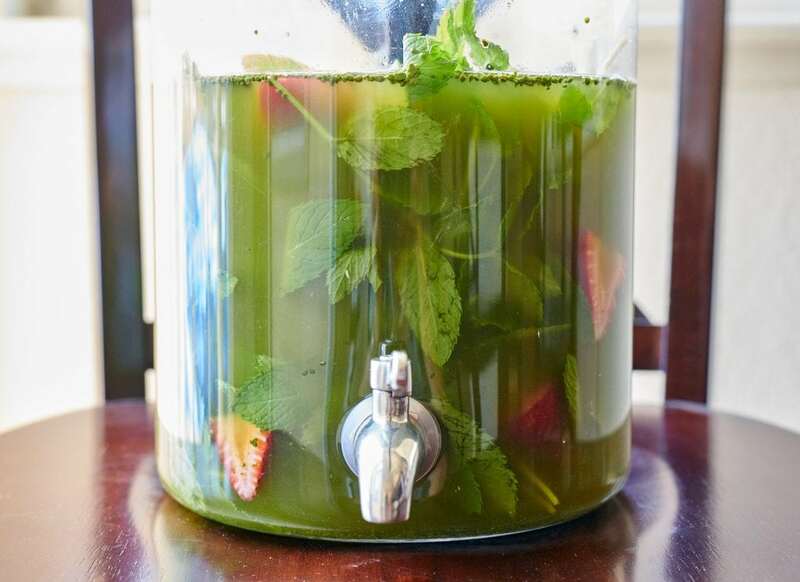 Start making your tea by adding lukewarm water to a large, clean jar, followed by 3-4 black tea bags, cut berries, lime halves, and fresh, rinsed mint. Allow it to steep for a few hours or overnight in the refrigerator. Stir in a little macha powder for color and flavor. This is optional. Macha powder is a dried green tea powder that is found in the tea aisle of your grocery store. And voila! 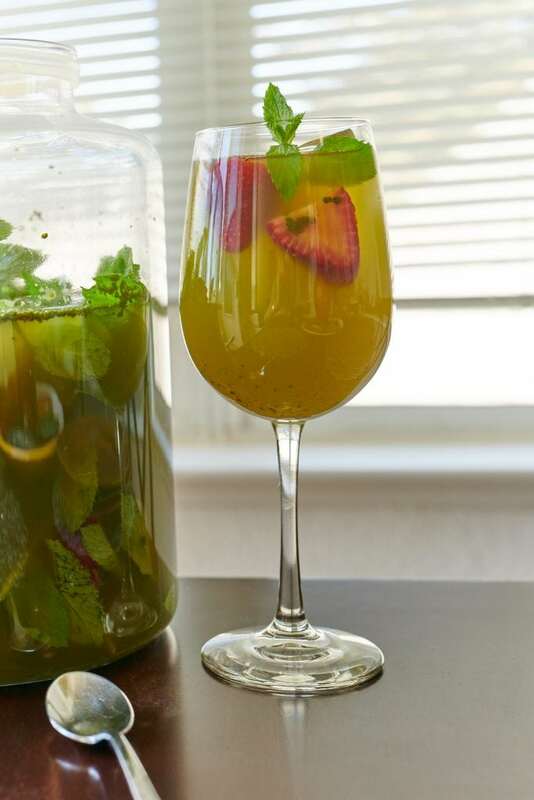 You have a refreshing tea drink for summer that is delicious any time of the day! The handy spigot jar calls everyone's attention when they open the refrigerator and this sugar-free drink disappears fast. And here is a nice way to serve fruit for dessert. Use a tray with bowls of fruits and serve with nonfat plain yogurt. This makes a great family style dessert that encourages conversation as everyone creates their own masterpiece. 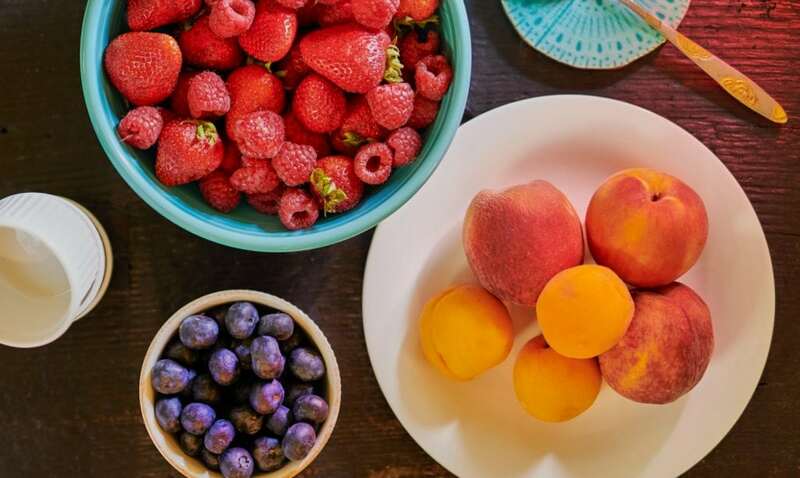 Serve with a fruit knife and a fork so everyone can their fruit fresh to order.